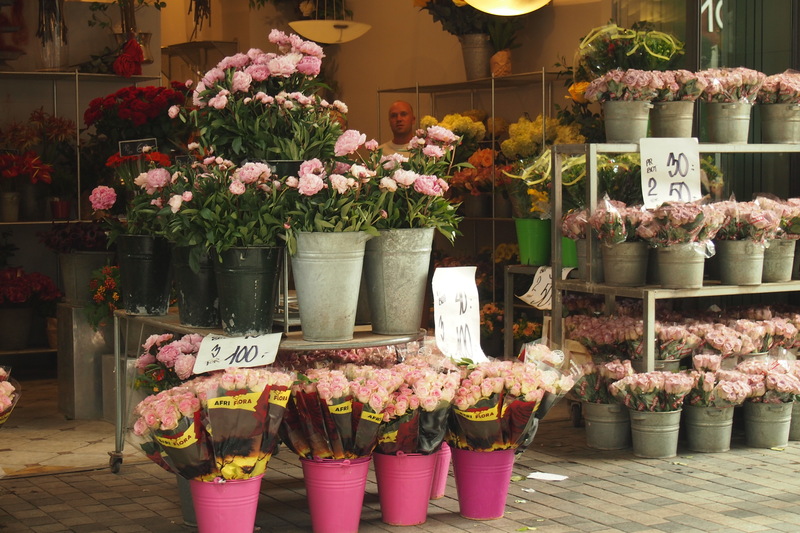 Copenhagen, a very pretty town full of history and beauty, so glad my unplanned trip took me there. It is truly amazing what you can fit into two and a half short days in a city when you have too. That’s all the time I had, flights to other places were organised and so Copenhagen was a transit city this time. But seeing as I was here I wanted to see all I could in the time I had. Hopefully there will be a next time to see more. 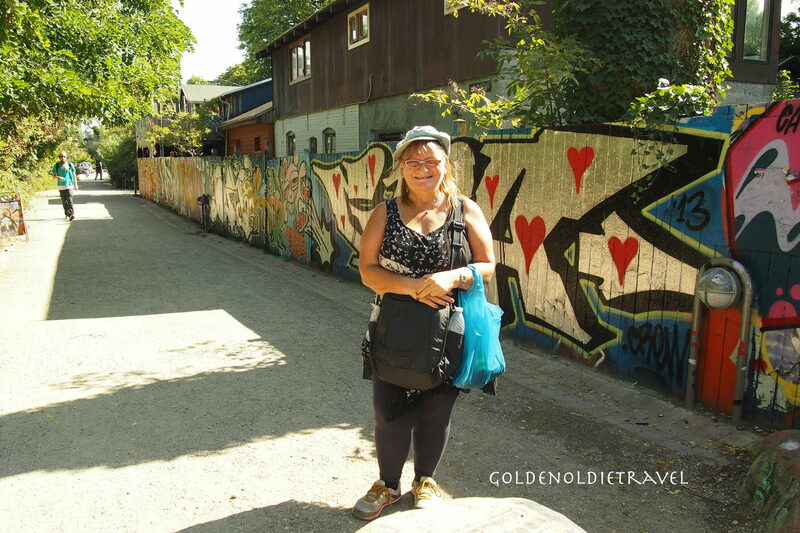 I had arrived safe and sound in the Generator Hostel in Copenhagen, after a fantastic train journey. 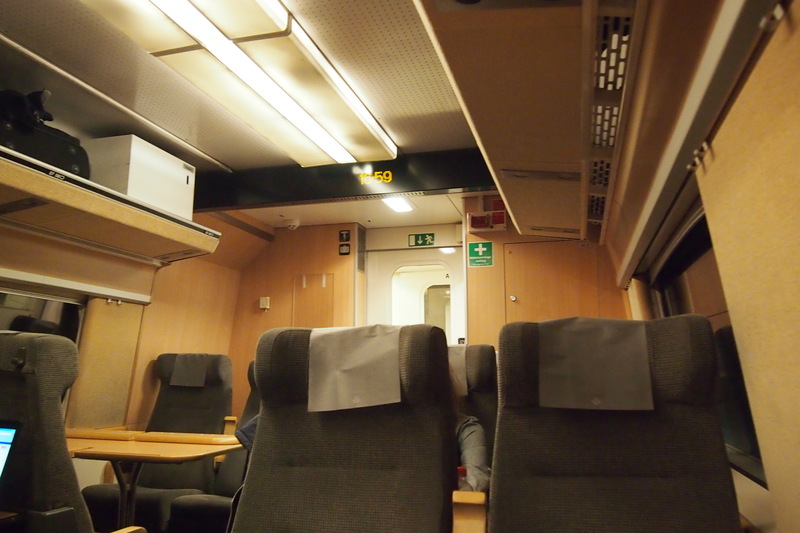 I loved the train from Stockholm, quiet, fast, comfortable, tables and power for the computer at every seat, a real treat. As if such a comfortable trip wasn’t enough, after Malmo (yes where Eurovision was held earlier that same year) there before me appeared the most amazing sight, the double decker Oresund Bridge over the Oresund strait. Eight kms of beautiful white bridge over blue water. Then the bridge turns into a tunnel for another 4 kms. A stunning piece of engineering. The motorway is the top level and the railway is the bottom level. 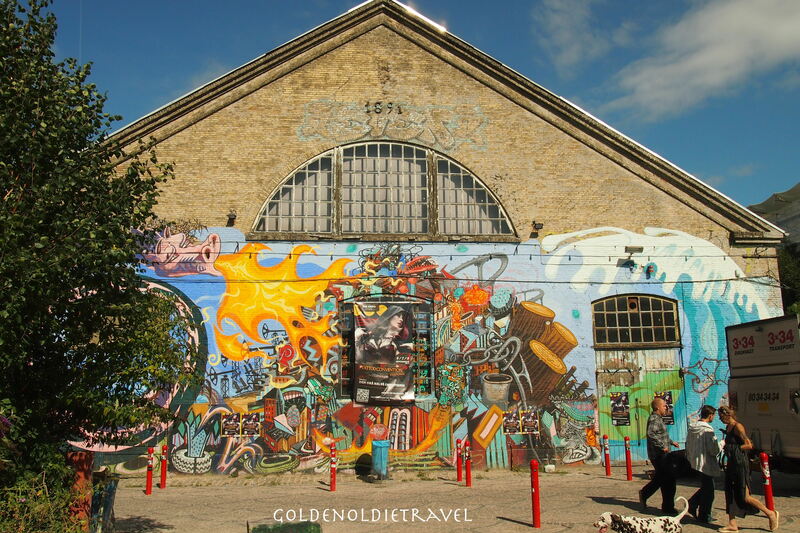 Such a beautiful entrance to Copenhagen. I caught a cab from the station to the hostel, better than dragging luggage around trying to find the place. The bits of the city I saw from the cab were delightful so I was looking forward to the next day of exploring. The hostel was pretty awesome, massive with its own bar, food and night time barbecues, so I knew I would survive. 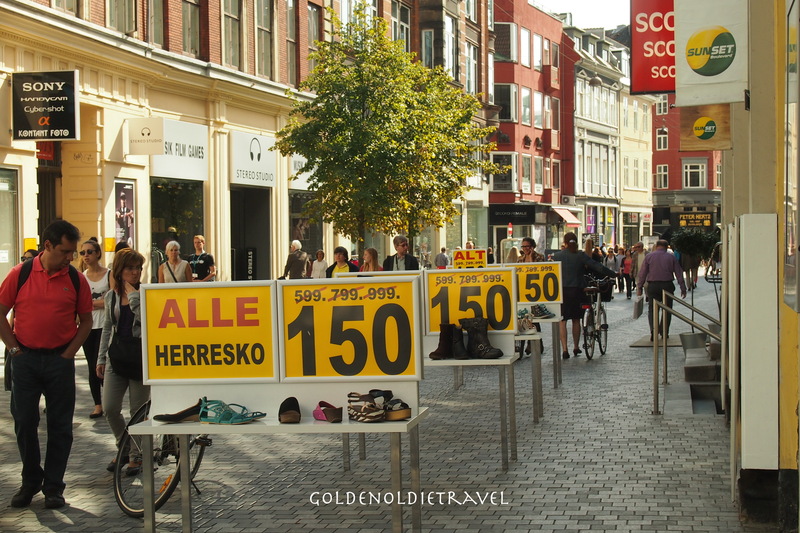 Remember that Scandinavian countries aren’t cheap so hostel prices reflect that (this isn’t the Balkans or Central America), do your research well and be prepared, most places are similar in price, nothing is cheap by any stretch of the imagination, but very worth it. I wasn’t exactly prepared for having a large group of drunk Swedes in the dormitory but, had I thought about it I would have expected it. It was hilarious watching one fellow trying to climb to his bunk and failing many times over. Eventually he gave up and fell asleep on the floor, oh the young ones! It was still the middle of Summer but the temperatures at this latitude were very pleasant, nothing like the 40 degree temperatures of the Balkans in July, so walking around was going to be enjoyable. First I needed to find a spectacle shop to fix my glasses, the screw had started coming loose and a lens kept falling out, bad timing for this to start happening I still had 8 months of travel to go. Stroget the pedestrian shopping street is a delight. 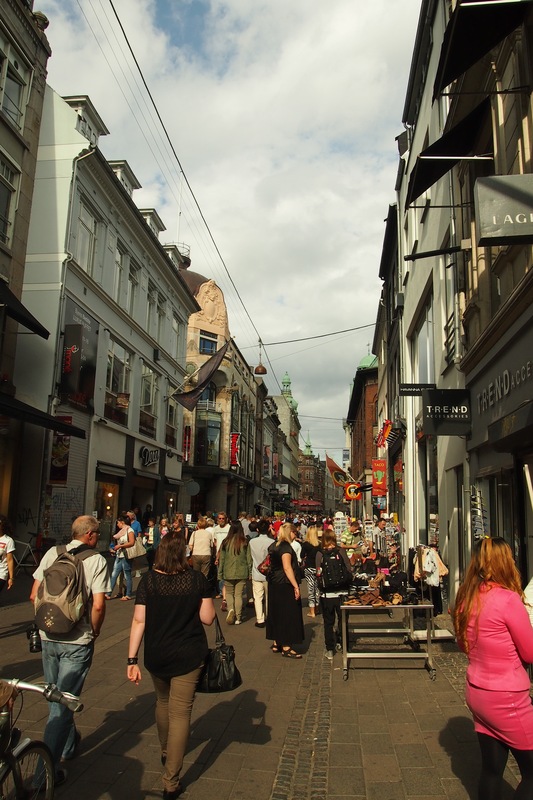 Really, European cities have got the concept of the central pedestrian shopping streets exactly right, we could learn a lot from them. Having found a spectacle shop and had my glasses fixed at no charge I was on my way to find the Hop on Hop off bus. 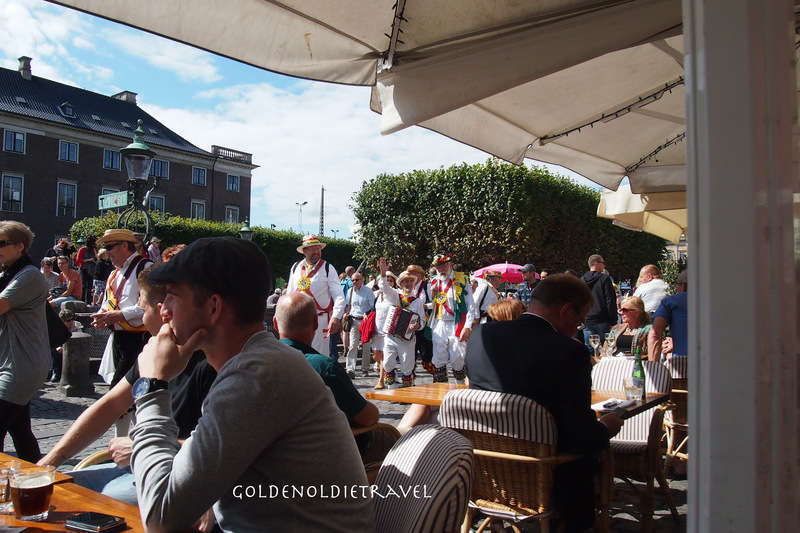 I have to say that by the end of the trip the guys running the buses there were the most disorganised I had ever experienced before and after Denmark. Everything was going well until one bus broke down then the replacement bus broke down. Instructions were confusing, people from the cruise ships were demanding their money back as they had no more time to wait for yet another bus, it was chaos for a while. Luckily it was at the very end of my tour so I didn’t care but I got a lot of amusement from watching what was going on. Before all the confusion and chaos though I’d had a wonderful trip. My main goals were Christiania and the Little Mermaid. I really enjoyed wandering around this unique place. 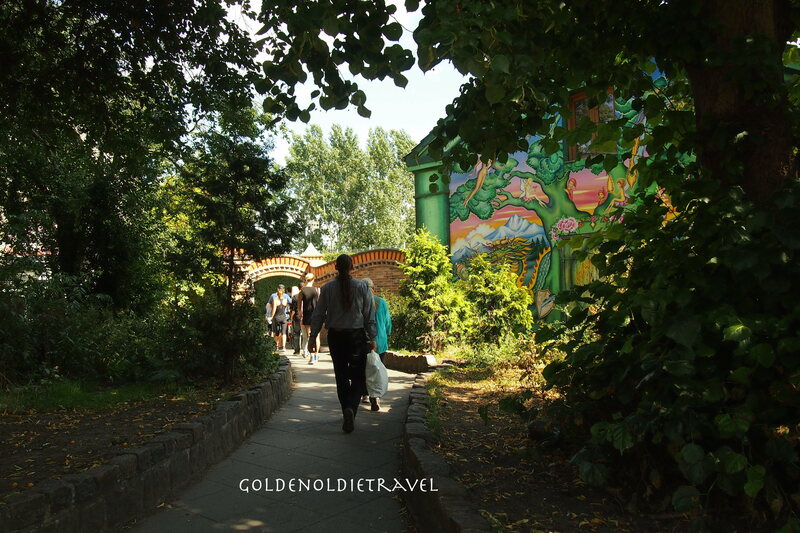 Christiania is a self-proclaimed autonomous area. It has about 850 residents. 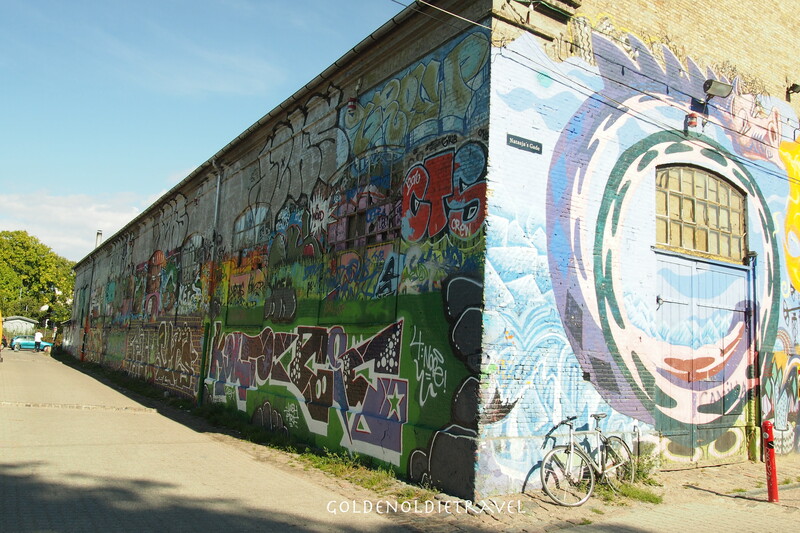 It is a controversial neighbourhood and has had many ups and downs since it started as a squat back in 1971. 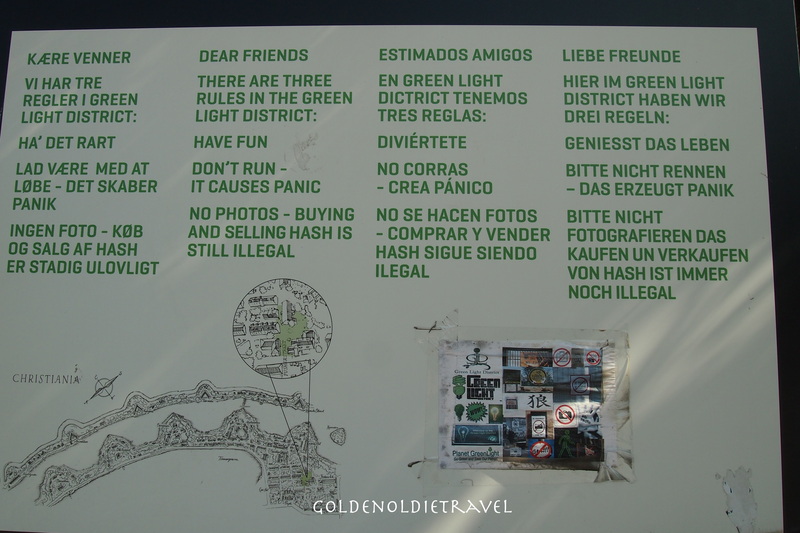 The cannabis trade in the neighbourhood is once again tolerated by the Copenhagen authorities but beware, if you walk out of Christiania and have cannabis on you, you will be caught. Within the streets of the neighbourhood there are very strict rules about photography, it is NOT allowed and trust me sneaking one in is not worth it. I saw one fellow caught taking a photo and out of nowhere a guy on a pushbike whizzed over and made him delete the shot, after all no one wants their photo plastered all over the internet especially if they happen to be doing a deal, it is after all, illegal. 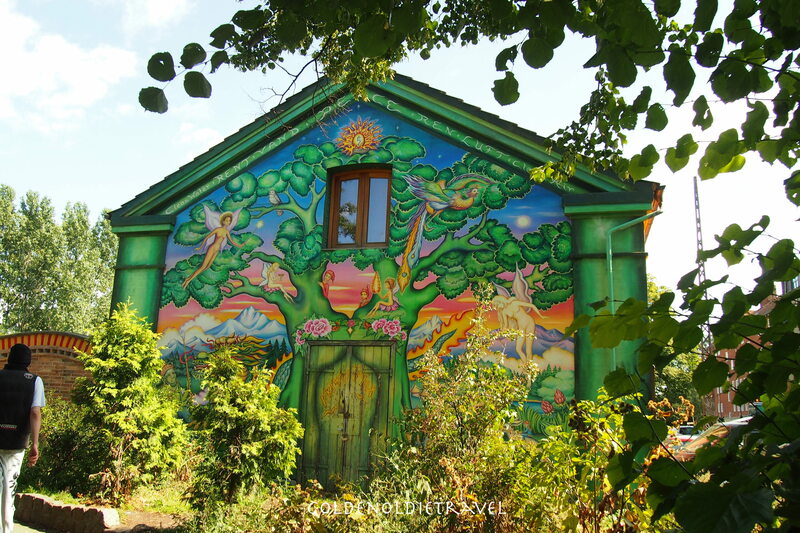 After all that cannabis talk a bit about the other side of Christiania that has nothing to do with drugs. The place is delightful, Freetown is a good name for it. It is full of artists, jewellery makers, musicians etc stalls are set up all over the place so there is a roaring trade in locally made souvenirs. 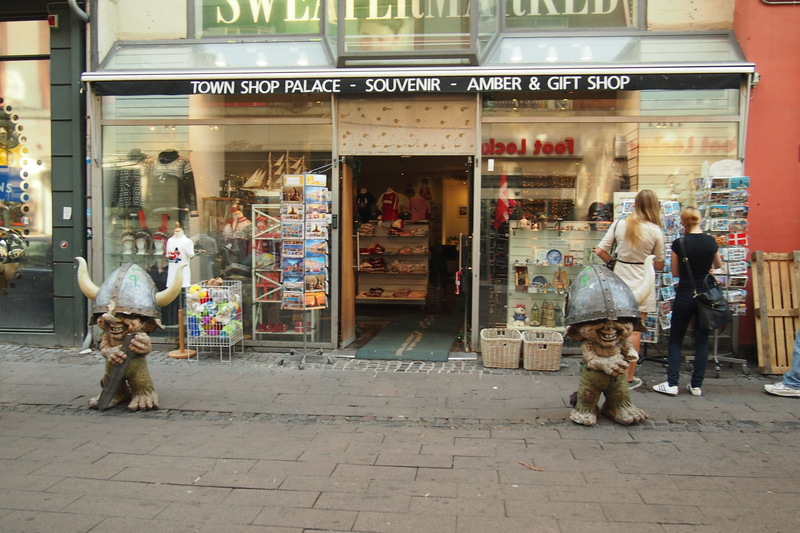 T-shirts and clothing of all sorts, jewellery, paintings pretty much anything. Buildings are decorated by the resident street artists and all in all it’s a very chilled out place. 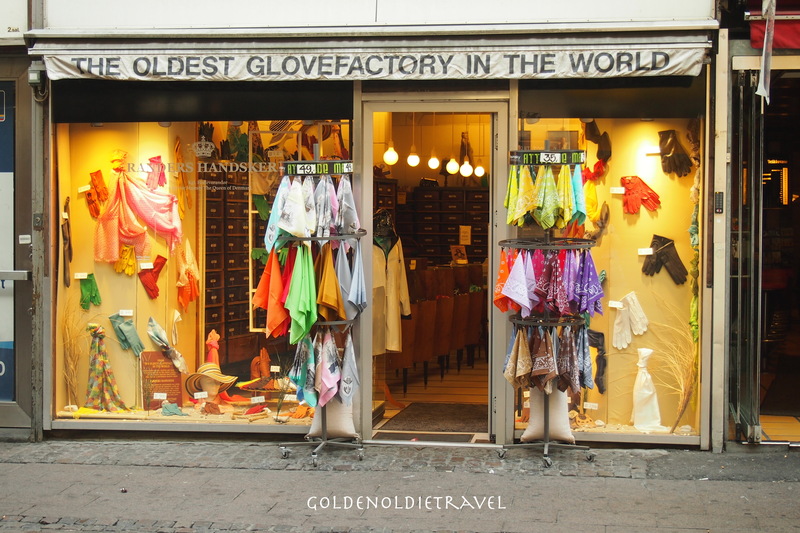 Definitely worth a visit, it is unique. I would have liked to stay on but there was so much more of the tour to do. Back on the bus and off to see the Little Mermaid. Yes she is little but perfectly formed. The poor thing has had quite a turbulent existence, decapitated twice, painted pink, blown off her rock and removed to Beijing for an exhibition just to name a few events. It was the wrong time of day for a good photo but at least I got some. 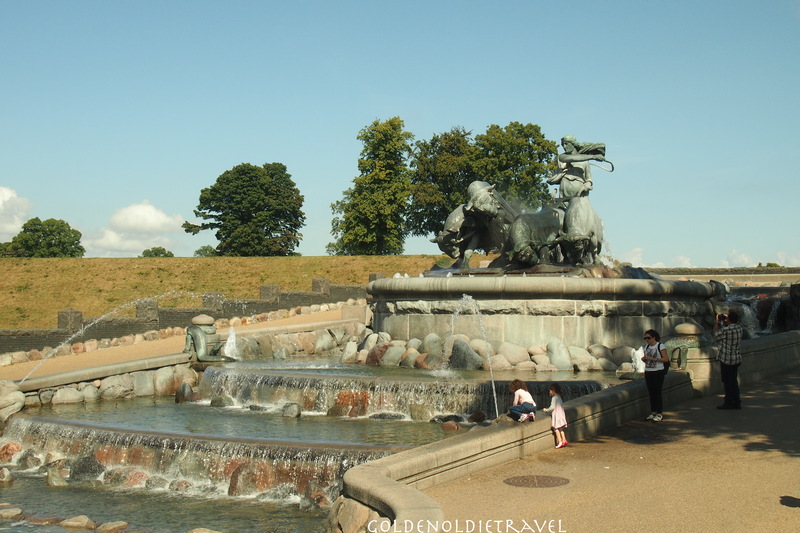 In the same area is the large and impressive Gefion fountain which depicts the mythical story of the creation of the island of Zealand on which Copenhagen is located. 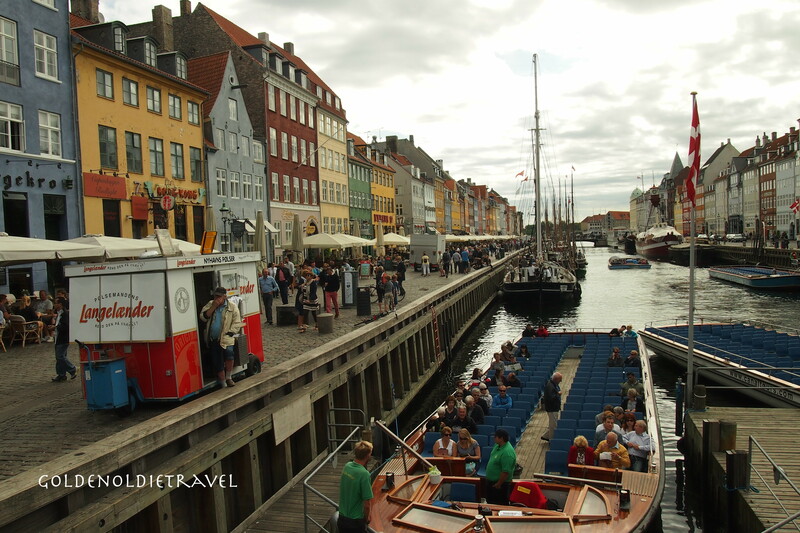 I had never realised that Denmark is actually made up of over 100 islands, a bit like Venice except this is a whole country. 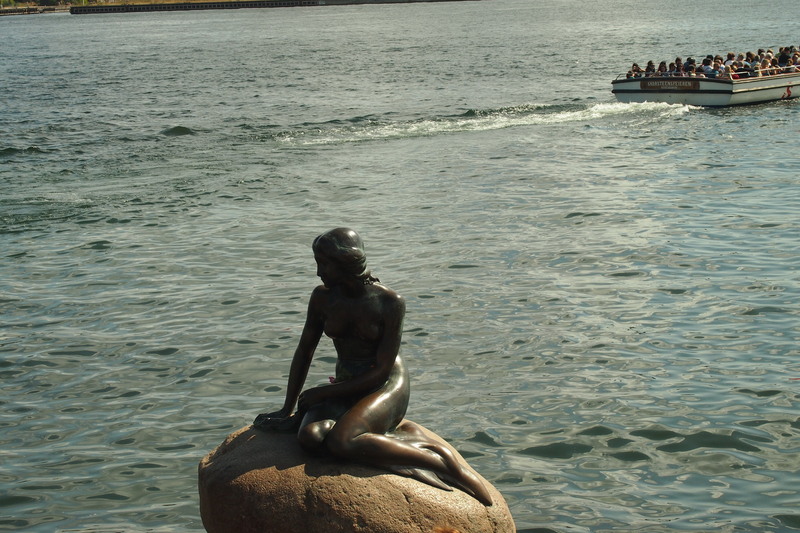 Copenhagen is full of impressive sculptures and fountains. I’ve discovered that anyone taking photos for commercial use has to verify that the artist has been dead for 70 years before posting the photos or they have to get permission to use them, thankfully I’m not commercial. Seems that there are various versions of these copyright laws in every city in the world relating to public artworks, the things you learn when you travel. 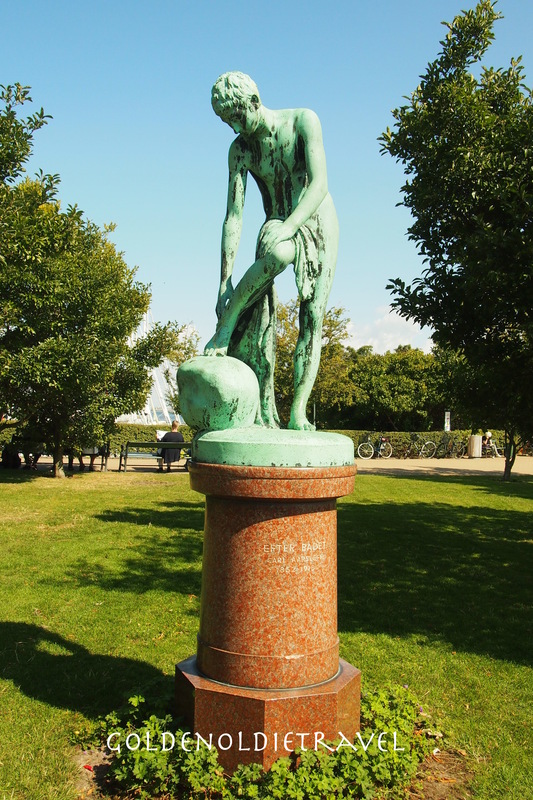 Copenhagen is full of sculptures and fountains, some of course are related to Hans Christian Andersen and his stories. 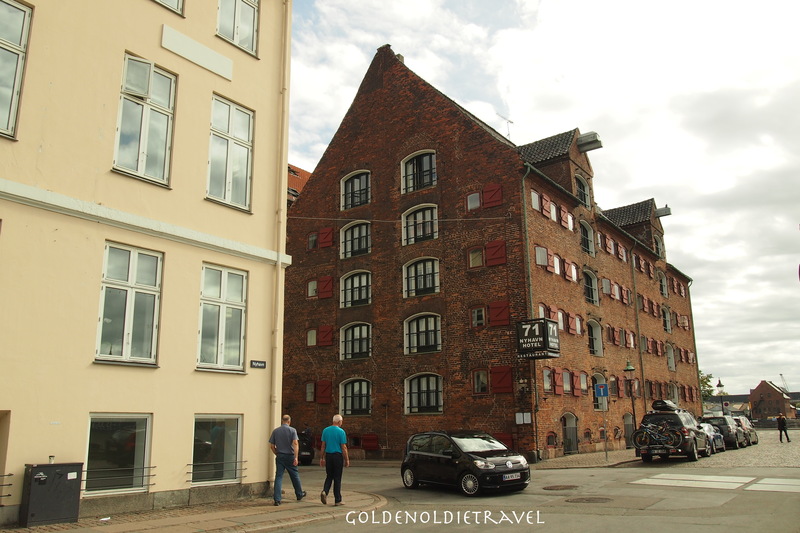 colourful buildings in Copenhagen? Yes it is as pretty as the postcards make it look. Like all ports it had quite a reputation in its day, as the commentary on the bus said ‘ you wouldn’t tell your mother if you’d been there’. These days it’s full of restaurants and expensive apartments. Of course I had to stop for coffee. 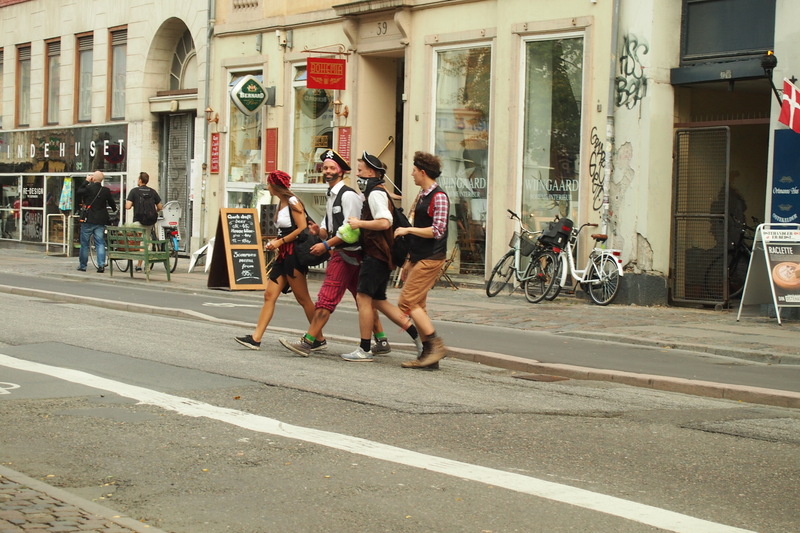 While enjoying my time there who should come along but a bunch of Morris men, yes, really, in Copenhagen! Are those homing pigeon coops? 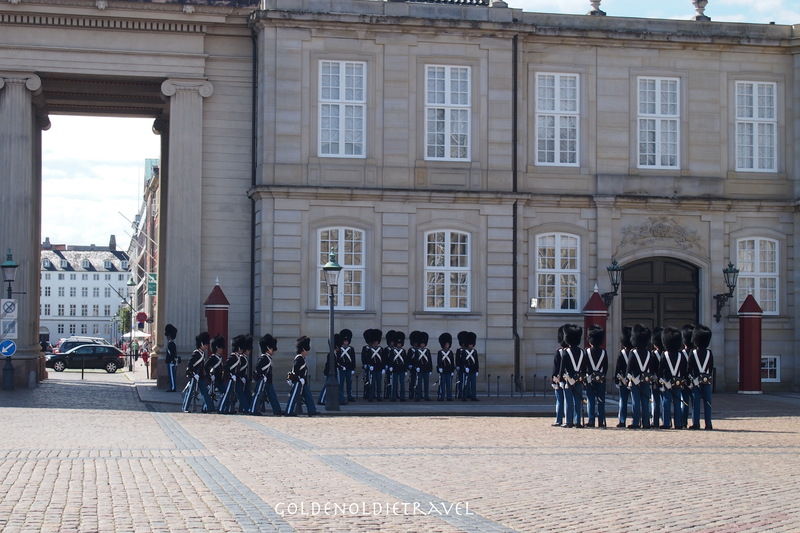 The changing of the guard at Amalienborg was a must, I arrived a little early so off for some exploring close by. 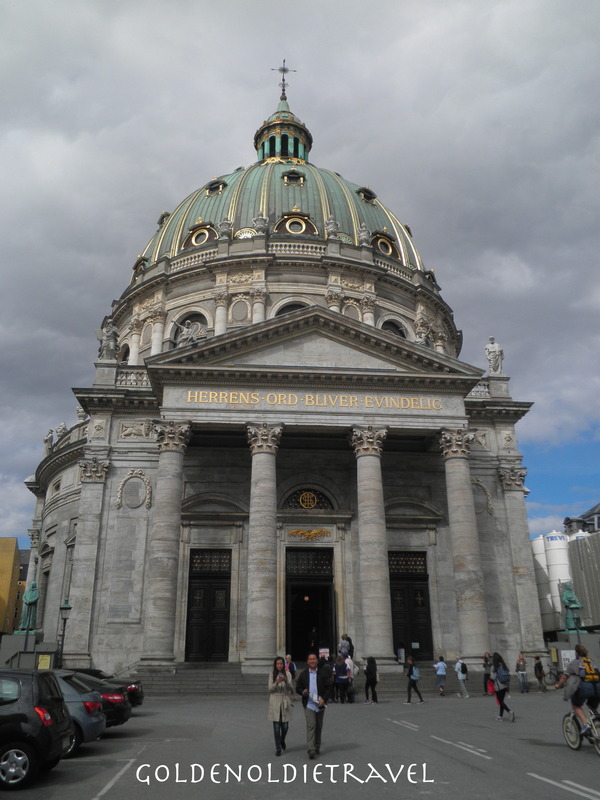 Not far from Amelienborg is the marble church which I also wanted to see, unfortunately there was a wedding on so I couldn’t get inside. 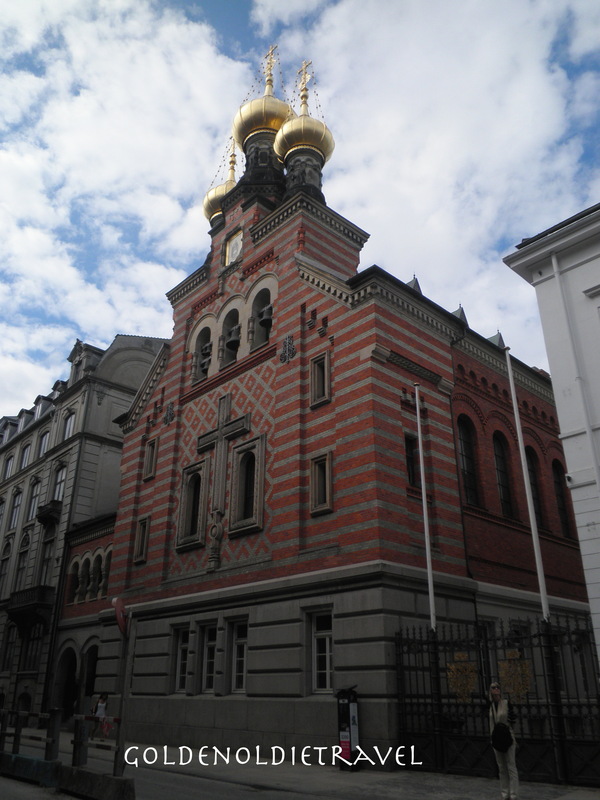 A little further down the street is the Russian church but it was also locked. 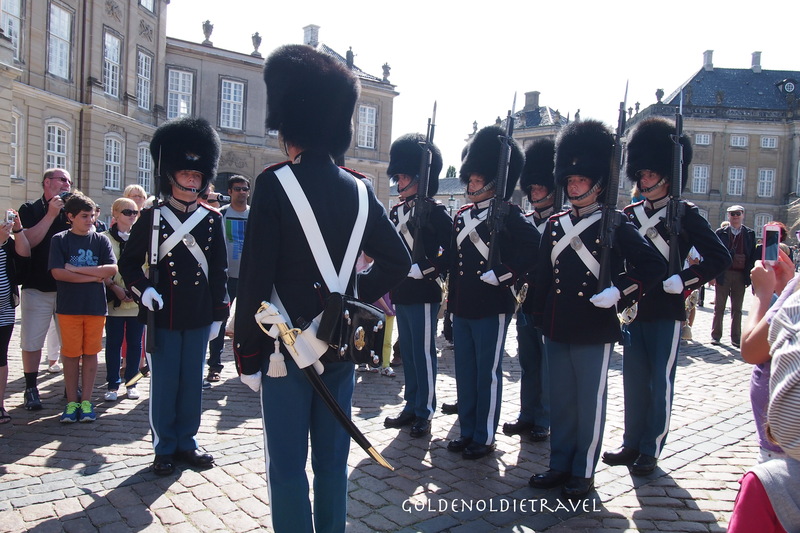 So it was back to catch the changing of the guard at the Amalienborg Palace (the Winter residence of the royal family) quite a process as there are 4 Palaces exactly alike and they have to do the changing ceremony at each one. This happens every day at 12 noon. There are four different versions of the watch depending which members of the royal household are present. We got the smallest version called the Palace Watch, this is when no royal members are in the palace, sadly no sign of Mary. 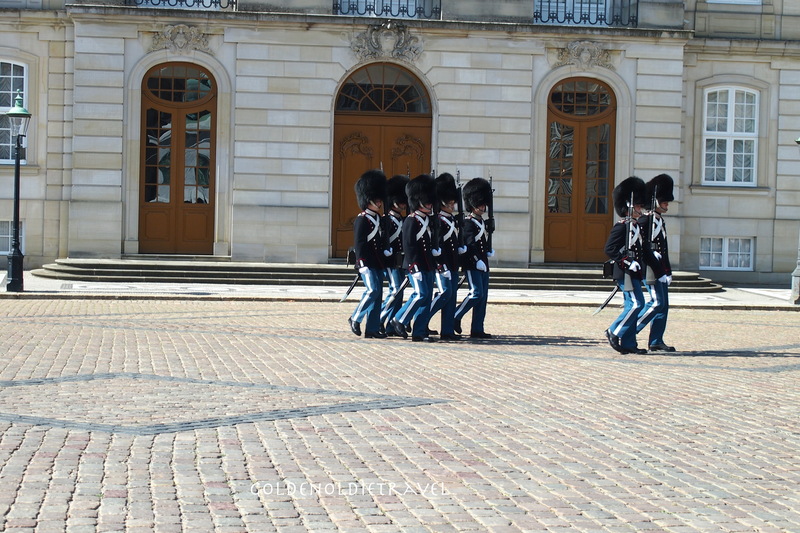 However, it is still very impressive with the young men in their blue and white uniforms and bearskin hats marching in very strict order. 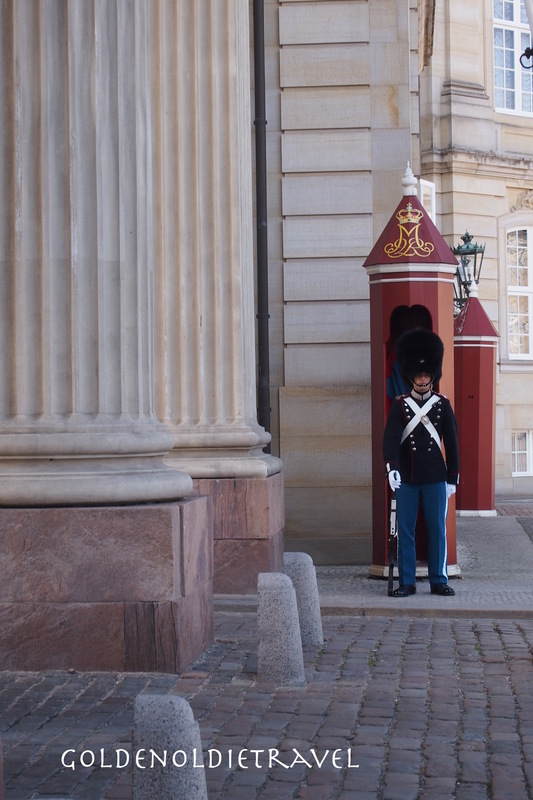 Changing of the guard, looks just like the chocolate soldier. Copenhagen, it is a pretty city and definitely worth a visit, backpackers beware though, it definitely isn’t cheap (even though the alcohol is supposedly cheaper here than in Sweden, but not by much) apparently it’s cheap enough for Swedes to come over here and have their weddings in the Swedish church and stay on for the reception, so that possibly explains the group in my dorm. And then it was farewell, I chickened out of singing ‘Wonderful, Wonderful Copenhagen’, one of my mother’s favourite songs, so it remained a very annoying earworm with nowhere to go. Packing finalised and off in the middle of the night to the airport. By bye Copenhagen I loved every minute of being there. 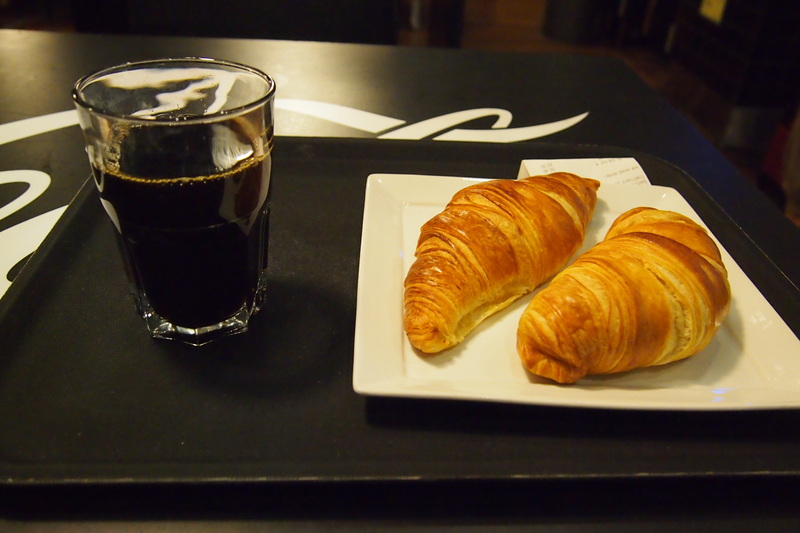 Finding decent coffee at 5am at Copenhagen airport proved impossible. I was totally confused when I asked a fellow at the only place open how to order a coffee and he went away and came back with a glass of liquid that looked like flat cola. After more questions I discovered that this was my coffee and I should go over to another counter to pay and get food. I have to say that was definitely the worst coffee I had ever experienced. So off I went in search of another place. 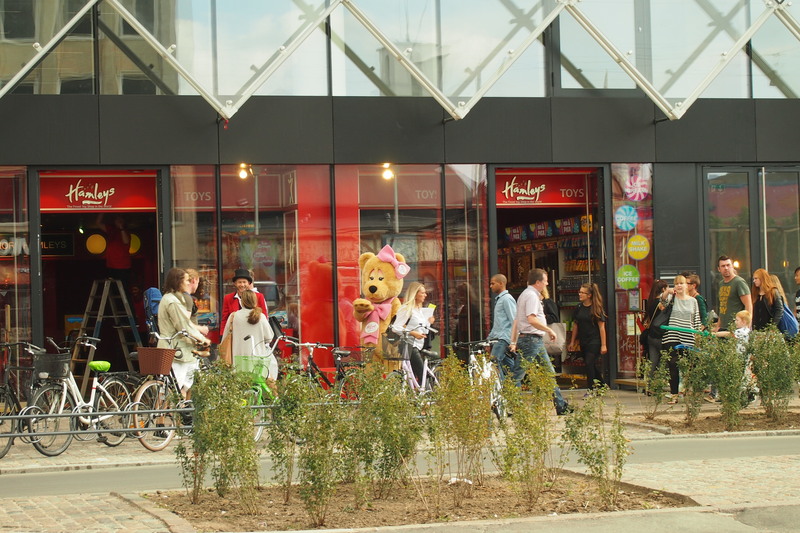 The only other place opened by this time was a Starbucks, oh dear! I don’t do Starbucks and I should have known better than to even try, but try I did and as always was highly disappointed, in fact, this one was even worse than usual and did nothing to kill the first coffee. 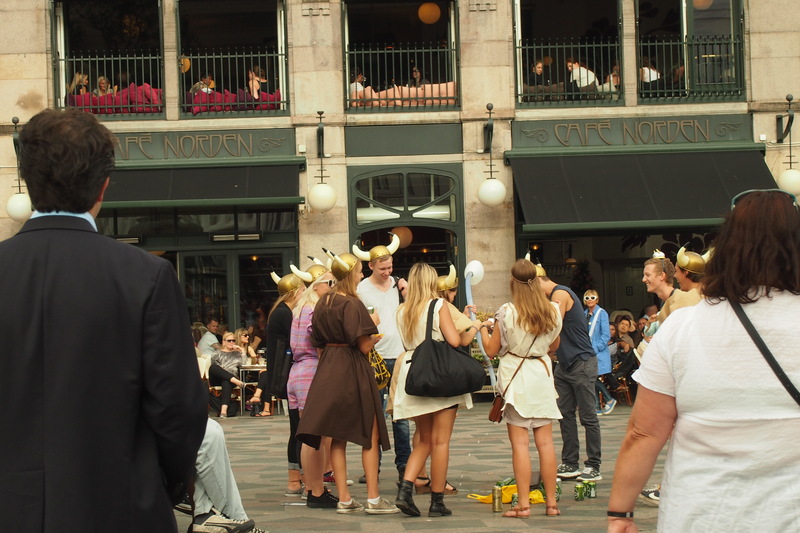 As the evening approaches Danes go partying. Flat cola? No worst coffee ever! 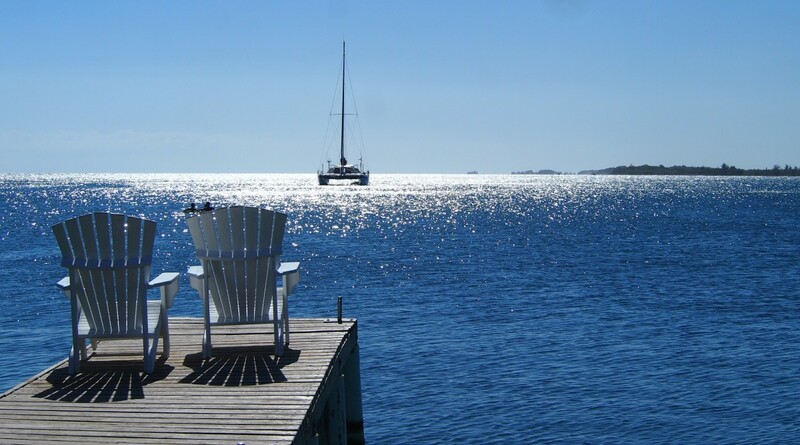 Not to worry, I was off to the land of coffee – Greece!